The life of Russian writer Yevgeny Zamyatin took a sharp turn after he spent two years in England as a marine engineer, building what turned out to be the first Soviet icebreakers. Back at home, the author of “We” was dubbed “the Englishman,” openly opposed Lenin, corresponded with Stalin and became one of Soviet Russia’s first dissidents. 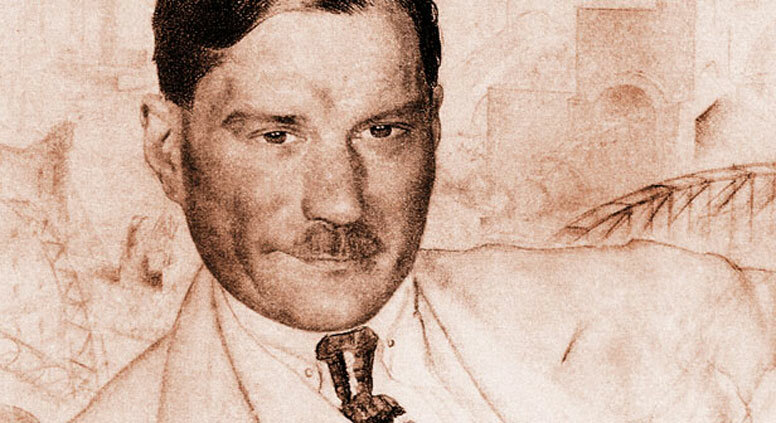 The world knows Yevgeny Zamyatin as the author of “We,” a milestone of 20th-century dystopian literature that presents an apparently ideal world where the Single State has suppressed freedom in the name of happiness. Both George Orwell’s “1984” and Aldous Huxley’s “Brave New World” have echoes of “We” in them. However, long before he wrote “We,” Zamyatin himself was influenced by the British writers he translated and the country itself. Born in 1884 in Lebedyan, Tambov province to an orthodox priest father and a pianist mother, Yevgeny Zamyatin had a clear talent for writing and a clear weakness for math, which he later ironically claimed was probably why he chose a math-based career. Zamyatin enrolled at the shipbuilding department of the St. Petersburg Polytechnical University, where he showed his nonconformist streak – he spent a few months in jail in 1905 for political agitation. “If I have any significance in Russian literature, I owe this all to the St. Petersburg Secret Police,” he later wrote. Despite these early brushes with the law, Zamyatin began working as an engineer and was sent to Newcastle in 1916 to supervise the construction of icebreakers for the Russian government. However, by the time the ships actually reached Russia, they belonged to the new authorities – the Bolsheviks – and were renamed accordingly. So, in an ironic twist, Zamyatin, one of the most outspoken early critics of the Soviet regime, actually designed the first Soviet icebreakers: “Lenin,” “Krasin” and others. The 18 months he spent in England were a melancholy time for the writer; in letters to his wife, Lyudmila Usova, Zamyatin complained that he could hardly communicate with the locals due to the language barrier, that the food upset his stomach, and that he had a permanent headache. Not to speak of constant German bombing raids – World War I was at its height. Zamyatin's two years in England greatly influenced him. He dressed according to European fashion, with a dandy-esque neatness and simplicity, and spoke with restricted politeness. These features, quite striking for a man born in deep the countryside, earned him the nickname “the Englishman” among his Russian friends. He even reached a level of proficiency with the language that allowed him to work as an editor and translator of foreign authors such as H. G. Wells, Jack London and Sheridan for various publishing houses. At first, Zamyatin was hopeful that the revolution signaled the start of a new social order in Russia. However, his hopes were soon dashed. He blamed Lenin for adapting the British doctrine of Taylorism – a management theory that aimed to increase workers’ productivity by rigorous analysis of labor processes. Zamyatin accused Lenin of attempting to turn socialist workers into living machines, and believed that the leader had betrayed the revolution’s values. Zamyatin went even further with articles openly condemning the massacres of workers who disagreed with the official orthodoxy and exposing the Cheka’s constant repression of the peasants. In 1921, the manuscript of “We” was rejected by the censors. That same year – perhaps as a reaction to his novel being banned – Zamyatin published “I Fear,” an essay that marked the end to any semblance of an official writing career he might have had in Russia. He wrote that “true literature can exist only where it is created, not by diligent and trustworthy functionaries, but by madmen, hermits, heretics, dreamers, rebels, and skeptics.” Considering that the revolution was only four years old at this point, Zamyatin was certainly amongst the very first dissidents. The writer eventually managed to get the manuscript of “We” smuggled to New York, where it was published in 1924. The Soviet authorities were outraged and Zamyatin was ostracized; he was demonized in the press, blacklisted from publishing and kicked out of the Union of Soviet Writers. Many others would have lain low, but Zamyatin wrote to Stalin himself in 1931, requesting permission to leave Russia. Zamyatin was unapologetic in his letter, explaining that being unable to write was the same as “a death sentence” – a bold statement in a country where political purges had already started. Fascinatingly enough, Stalin granted the writer’s request. Zamyatin became one of the rare public figures who were allowed to leave the Soviet Union in the 1930s, and he headed straight to Paris, where he found work as a script writer. In an unusual twist, Zamyatin wrote to Stalin again in 1934, this time asking to be allowed back into the Union of Soviet Writers. He had not been accepted by the society of Russian émigrés in France, and he was in a tough financial situation. Membership to the union, however, would allow him to receive payments and royalties that would support him through the difficult times. In an unprecedented move, Stalin agreed, and Zamyatin became the first and only émigré writer to regain membership of this official organization. The following year he even took part in the anti-fascist International Congress for the Defense of Culture as a member of Soviet delegation, alongside Alexei Tolstoy and Boris Pasternak. Yevgeny Zamyatin died in Paris in 1937 at the age of 56 and was buried at the Thiais cemetery. His death went unnoticed and unreported in his home country. It would be more than half a century before “We” was finally published in the Soviet Union – in 1988, during the regime’s twilight years.